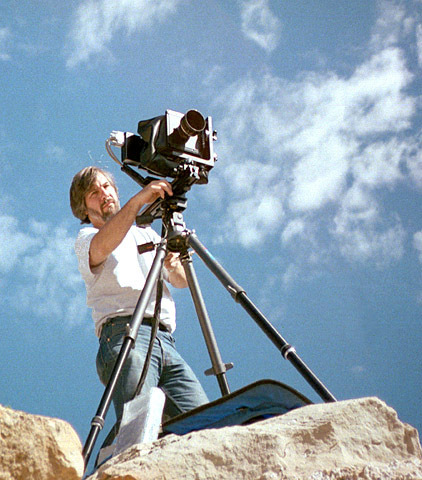 Stephen Johnson at Bryce Canyon by Darin Steinberg. 1994. Stephen Johnson is a photographer, designer and educator. His photography explores the concerns of a landscape artist working in an increasingly industrialized world. His work has also concentrated on refining the new tools of digital photography and empowering individual artists to use these tools to express their ideas. He was the Curator, and Editor/Designer for At Mono Lake, a book and National Endowment for the Arts funded exhibition which toured the United States from 1980-1983, reaching an audience of over two million people. In 1988, he was awarded a Congressional Special Recognition Award by the U.S. House of Representatives for his work on behalf of Mono Lake. Mr. Johnson was co-creator of The Great Central Valley Project (a photographic exhibit and book) that used landscape photography to examine the dramatically human-altered heartland of California. In 1988, using an Apple Macintosh computer, he edited, designed, and created the graphics for the award-winning The Great Central Valley: California's Heartland a 264 page book published by the University of California Press in 1993. His Making a Digital Book was published late in 1993 documenting how computers were used in creating California's Heartland. O'Reilly Media published his comprehensive and seminal Stephen Johnson on Digital Photography in 2006. Since 1989, Johnson's photographic work has explored computers as new photographic and design tools. He is finishing work on a historic endeavor, the ground-breaking digital national parks project With A New Eye, using digital sensors to make his photographs rather than film. This work concentrated on the use of a digital 4x5 camera made by BetterLight. Long-term projects also include the digital scanning and restoration of a 600 glass-plate negative collection from the early nineteenth century, and many ongoing projects based on his original photographs. He was recognized by Apple Computer in 1997 with a ColorSync Profiling Excellence Award. In 1999, Folio Magazine declared the publication of Johnson's digital photographs in Life Magazine to be one of the Top 15 Critical Events in magazine publishing in the twentieth century. Stephen Johnson was named as a 2003 inductee into the Photoshop Hall of Fame, recognized for his achievements in Art. Canon named Steve as one of their Explorers of Light in 2006 and sponsors speaking engagements with him around the country. In 2007 X-Rite named Stephen as a founding member of their exclusive Coloratti group of photographers and educators honored for their skills in color management. In 2010 Stephen premiered a new body of work Exquisite Earth based on the previous 5 years of work exploring the planet and published a limited edition 10 print portfolio from the project in 2011. Internationally recognized as a digital photography pioneer, Johnson's photographs have been exhibited, published and collected in public and private collections in Europe, the US and Japan. His photographs are part of the permanent collections of many institutions including the Oakland Museum, the Getty, the City of New York, the University of Texas at Dallas, and the National Park Service. Corporate collections include Apple, Minolta, and the Packard Foundation. Stephen Johnson's work in digital photography, and digital imaging consulting has included software and product development for clients such as Adobe Systems, Agfa, Apple Computer, Eastman Kodak, Epson, Foveon, Gretag-Macbeth, Hewlett Packard, Leaf Systems, NEC, Newer Technology, Radius, Ricoh Corporation, SuperMac Technology and X-rite. His work with Adobe included the creation of the duotone curves shipped with Photoshop and two quadtone posters. He designed an innovative rotating negative-carrier system for the Leaf Scanner. Additional clients have included Hatcher Press, Bentlyhouse, Glimmer Glass, Makena Capital, and the University of California Press. Photographic clients have included the Ansel Adams Publishing Trust, the Friends of Photography, the National Park Service, the Wadsworth Anthenium, and the Fine Arts Museums of San Francisco. Friends of Photography chose his work as their first digital image in their fine print collector's program. Steve has consulted with numerous private and public archives on the scanning and digital preservation of their photographic collections. For more than 20 years, Stephen Johnson has played an influential role in the development of the photographic tools used today. In the late 1980s, he consulted with various high tech firms on the development of digital scanners and printers. By the early 1990s he was working with Adobe, Leaf and Betterlight on the development of software and digital camera hardware. The mid-1990s further expanded his high tech consultation to include Apple's Advanced Technology Group, QuickTime VR and color management with Gretag MacBeth. The late 1990s brought deep work with Epson on the development of their pigment based printers and with Foveon on the development of their full-resolution X3 color sensor. Work in the last decade has included the design of the Museum Etching paper for Hahnemühle, and working with Hewlett Packard in Barcelona on the conceptualization, design and performance of the self-profiling Z Series Digital Fine Art printers. His 20 year relationship with Adobe has continued to influence product development on Photoshop with his recommendations continuing to find their way into products including Photoshop CS6's Camera RAW 7/Lightroom 4. This record puts Steve in the singular position of photographing with a camera he had deep influence on, editing with software he played real roles in expanding and customizing, printing on printers he helped design, on paper he did design. His has been a truly remarkable career journey, pioneering a level of involvement in the development of the tools of his trade that may be unprecedented. Steve is widely known for his communication skills and passion as a photographic educator. Having taught at various colleges since 1979, he founded his own workshop program that same year, leading trips all over the western United States and internationally. With the Community College Foundation in 2003 he helped create the Magical Digital Bus, a fully equipped Macintosh digital photo lab on a 40 foot bus, designed as a portable classroom for remote teaching. In 2006 he constructed a very high-end teaching facility in his own studio. He has developed curriculum for art colleges,and trained whole college-level photo departments in digital photography issues. His international teaching has led him to England, Scotland, Ireland, Italy, the Netherlands, Germany, Sweden, Mexico, Iceland, Ecuador, the Galapagos, and on three voyages to Antarctica. He has taught photography at the college level since 1979, and for Kodak's original Center for Creative Imaging in Camden Maine during the early 1990s, numerous workshops for industry, designed digital photography programs, and has an ongoing photography, publishing and consulting business. He has lectured for leading digital and photographic industry forums, including: Seybold, MacWorld, Image World, VISCOM, PhotoEast, PhotoWest, PhotoPlus, Fotofusion, the Agfa Technology Expo, FOGRA (Germany), Digital 95 (Great Britain), GATF Conferences, Link 2000 in London, the International Symposium on Electronic Photography at Photokina (Germany), the Lennart Nilsson Conference in Copenhagen, for the ASMP at various locations, the Maine Photo Workshops, the Santa Fe Workshops, University of California, National College of Art in Ireland, the Jet Propulsion Laboratory (JPL), the Art Center in Pasadena, the School of Visual Arts (SVA) in New York City, Xerox PARC, Rutgers, University of the Arts in Philadelphia, Massachusetts Institute of Technology (MIT), and at Stanford University. Steve's photographs have graced magazine and book covers, and been featured in television news and features. His work has appeared in Life Magazine, American Photographer, Communication Arts, Camera Arts, Omni, Audubon, Sierra, Publish, Hemispheres, Electronic Publishing, Adobe Magazine, California Magazine, California History, MacWeek, MacUser, Photo District News, pdn's PIX, Photo Electronic Imaging, MicroPublishing News, Landscape Magazine, Popeye Magazine (Japan), HallÂ Magazine and Fotografisk Tidskrift (both from Sweden), Page Magazine (Germany), Advanced Imaging Magazine, IdN Magazine (Hong Kong), the Adobe Photoshop Deluxe Edition CD ROM, Nautilus CD ROM Magazine, The Los Angeles Times, The New York Times, On-Line Design, Digital Video Magazine, US News and World Report, and featured on television's The MacNeil Lehrer Newshour, The Discovery News, New Media News, and The Computer Chronicles. Penguin books used a series of his work on new editions of one of Steve's favorite authors, Wallace Stegner. Steve's love of poetry led to a friendship with Pulitzer-prize winning poet George Oppen and his wife Mary. In 1977 Steve reproduced numerous historical photographs and made many new images for Mary Oppen's autobiography, Meaning a Life. His work on environmental issues dates back to his early involvement in political campaigns, working for the California Coastal Initiative in 1972, helping to form a high school Ecology Club, and helping to found and manage a community Recycling Center in his hometown of Merced, California. His efforts continued into his professional life as an adult with his work on behalf of Mono Lake, the Great Central Valley and the national parks including recent direct involvement of saving Mori Point for addition into the Golden Gate National Parks. His photographs have appeared in Sierra Magazine, Audubon, Pacific Discovery and numerous other environmentally focused publications. He currently serves on the board of the Pacifica Land Trust and continues his work with a number of government and private environmental organizations. Copyright ©2017, Stephen Johnson. All Rights Reserved.